After our last Disney World vacation, I had over 3,100 photos to go through. I could have just let them languish on my hard drive, but, almost immediately, I knew what I wanted to do with them: make a photo book. Obviously, I couldn’t fit all 3,100 in one book so I had to make some cuts. And by some, I mean about 2,800 photos. Still, the resulting photo album is a good representation of our trip. As much as a photo book appealed to me, I would have been scared off by the price. It normally costs $19 for the first 20 pages and $0.50 for each additional page (up to 100 pages). So a 100 page photo book would cost nearly $60 (plus shipping). Luckily, WinkFlash.com had one of their flat rate photo book sales. Up until January 27th, additional pages are free. So my 100 page photo book will only cost $19. I could order three of them for the price of one. So my Aloha Friday question to you is: Have you ever made a photo book of your trip? If not, how do you immortalize your vacation memories? I have plans to! Our honeymoon was in Cancun and I have all the pictures, books and paper suveniers in a basket. But…. we got married 7.5 years ago and I haven’t found the time to put it together yet, lol! Maybe one day right? 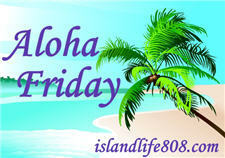 .-= Kimberly@PrettyPinkMomma´s last blog ..Aloha Friday – Girl Scout Cookies =-. I pretty much always make photo books of our vacations and now that I know about WinkFish I am going to have to head over there and make a photo book of my recent trip to Ethiopia. .-= Upstatemomof3´s last blog ..MY Type Of Parenting =-. Yes, With today’s computers and Digital Picture frames, It is easier. Just use a program doctor the photo,s with words and embellishments and load them on the frame, set it to rotate through the photos. We did this for my dad and he just loved it. .-= Auntie E´s last blog ..Aloha Friday-Weather outside is frightful…. =-. I recently made my first photo book through Scrapblog (product review) and I loved how it turned out! .-= kailani´s last blog ..Project 365: Day 21 =-. I save my vacation pics to my computer but have not really done a photo book, now that I see this, It is a great idea to do so. .-= JamericanSpice´s last blog ..Aloha Friday: Outhouse =-. I am a big scrapbooker and LOVE to scrapbook all of the pictures. I used to scrapbook a separate book for everything. Now I have one Christmas book and every Christmas, there is a 2 page spread in there. Then I have one vacation book and each vacation I do a two year spread…and so on and so forth. I make photo books of like “year in review” from time to time but not a specific vacation. .-= Jen E @ mommablogsalot´s last blog ..aloha friday: sweet dreams and not so sweet ones =-. Not yet, but I’m planning to. At the moment I have my vacation pictures in my laptop. No, not online, although I’ve done many scrapbooks. I really should do the photobook thing though. I went on a band trip to NYC a few years ago and made a book via Walgreens.com. They made it so easy to do and they sent copies to my parents. No, I wish I had. All my photos (back in the old days when digital did not exist) are in boxes. Yes I make photo books of the wonderful vacations ive taken/well more like scrapbooks… but i do record them all. We moved to New Mexico from england aswell.. and I have a NM scrapbook. wherever we move to next i’ll be sure to do something. I like thing i can keep. When we move i might get a 4×6 album and put in all the highlights of our life in New Mexico. Remember the best parts. I might have an upcoming blog post that could help you. I recently scanned in a bunch of my grandmother’s old photos and was going to post about my experiences. I know there are services (such as ScanMyPhotos.com) that will do it for you, but I felt more comfortable doing it myself. YMMV, of course. I just put pictures in albums. .-= JDaniel4’s Mom´s last blog ..Friday Fill-In #160 =-. .-= TheAngelForever´s last blog ..Cousins then and now =-. I am more of a video lady myself! I find it more interactive and alive! Haha, pictures are tough cause it feels to me like it stops the flow at times, and can be quite expensive I know. So, I swear by videotapping, that’s my style anyway. 🙂 Hope you’re trip was fabulous.